One year after the death of David Zard, one of the greatest producers and promoters of live shows, Assomusica, the italian member of ELMA, gave the award established in 2018 to Pippo Baudo, a true legend of Italian television and one of the most influential personalities in the entertainment world. 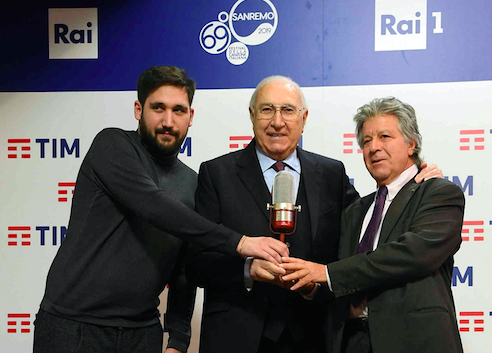 The award was presented yesterday at the press room of the Ariston Theater in Sanremo. Pippo Baudo was chosen for his significant talent scouting activity and for having contributed to the discovery and appreciation of many stars in the Italian music scene. “A recognition to a great showman, who has never lost sight of the growth of young talents, and therefore the development of creativity” said President of Assomusica Vincenzo Spera, adding: “Baudo has always given ample space on television to music in all its forms, and it is not by chance that David Zard was often a guest in his programs. There is a strong link between worlds that seem to be separate but instead interact, and this has led us to identify it as a character worthy of receiving this special award in its second edition “. David Zard, a pioneering concert promoter who was the first to bring some of the biggest names in rock music to Italy, died last January, aged 75. Born in Tripoli, Zard (pictured) emigrated to Italy in 1967, fleeing persecution of Libya’s Jewish minority after the Six-Day War, and over the next five decades established himself as one of the country’s leading promoters, organising stadium tours by Cat Stevens, Elton John, Tina Turner, Lou Reed, Frank Zappa, the Rolling Stones, Genesis, Bob Dylan, Madonna, Michael Jackson and more. He was also a record producer, a longtime ILMC member and a booking agent, to Italian singer-songwriter Gianna Nannini, among others. In recent years Zard and his company, Saludo Italia, focused on stage shows, most recently producing the 2013 musical Romeo e Giulietta – Ama e cambia il mondo (Romeo and Juliet – Love and Change the World).